The recipe for an unabashedly loud, fast, and obnoxious SUV sounds like something straight out of the American automotive playbook. 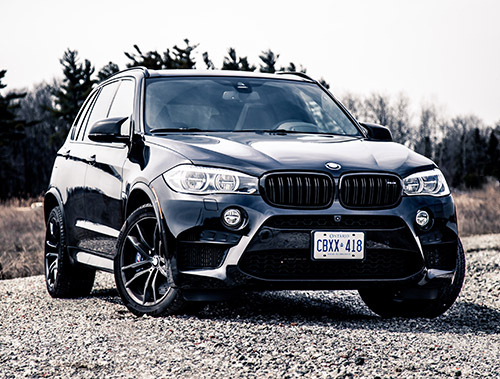 And while Jeep was one of the pioneers of the formula via the Grand Cherokee SRT8 (and previous to that, the 5.9 Limited), the segment really took off when BMW unveiled its fire breathing twin turbocharged X5 M a scant four years later. 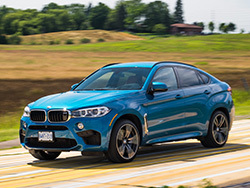 The relaunch of the current SRT in 2012 never quite made the same splash, and Europe’s dominance of this upper tier of luxury performance SUVs continues through the Porsche Cayenne, Mercedes-AMG GLE, Range Rover SVR, and the aforementioned BMW X5 M and X6 M duo. That is, until now. 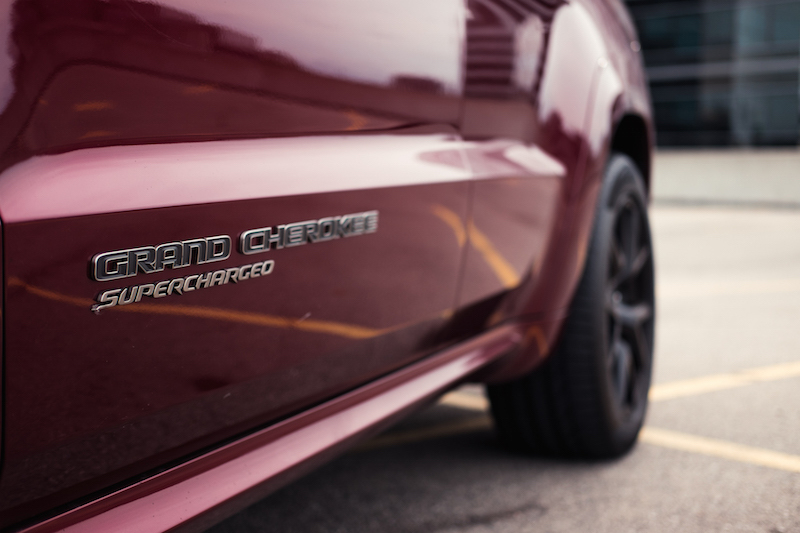 Jeep is re-entering the ring with their latest contender, the Grand Cherokee Trackhawk. 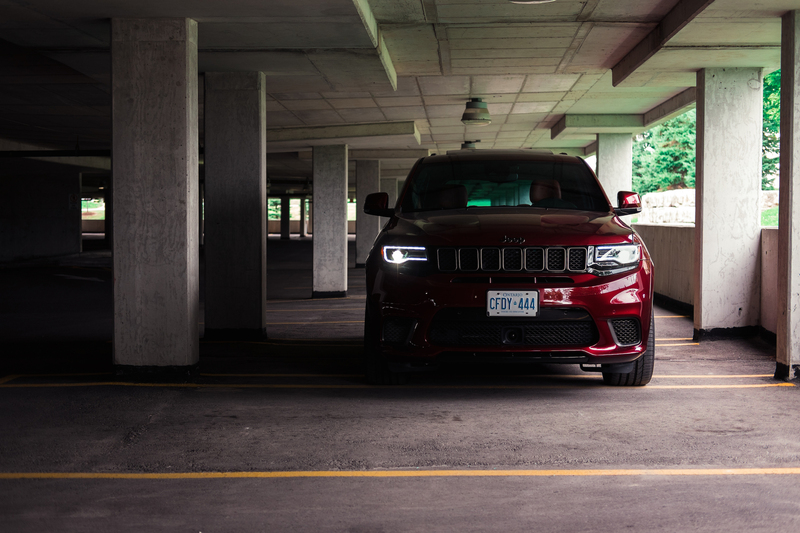 Riffing on their own “Trailhawk” nomenclature that denotes a more off-road capable Jeep, the Trackhawk implies the same level of grandeur, only on asphalt. 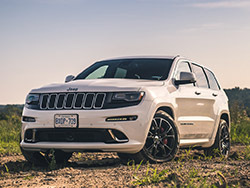 To accomplish that, they tossed the 6.4L V8 HEMI found in the more pedestrian Grand Cherokee SRT, in lieu of the maniacal 6.2L supercharged V8 from the Dodge Charger Hellcat. Of course this also means the Hellcat’s claim to fame of 707 hp and tarmac-warping 650 lb-ft of torque comes standard here. It wasn’t a straight port of the drivetrain however, as Jeep had to adapt the AWD system for the extra output from the 6.2L. The ZF-sourced 8-speed transmission has also been beefed up to handle the added might, as has the rear drive-shaft, half-shafts, CV joints, and differential. 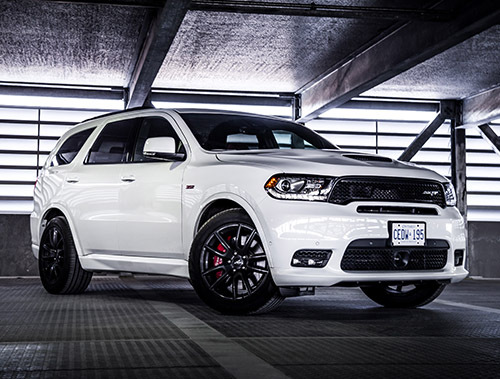 Visually, you’d be hard pressed to spot the difference between a Trackhawk and an SRT. The front fascia for example sees the removal of the fog lights for a supercharger intake and a larger oil-cooler. 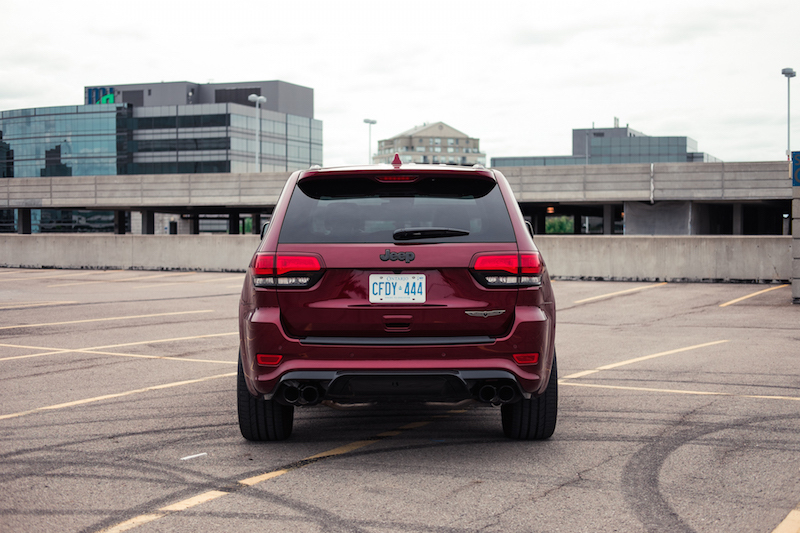 In addition, six-piston Brembos in an exclusive yellow colour grab onto slotted rotors up front (the largest ever on a Jeep), a revised rear bumper house the quad exhaust tips, and a tiny Trackhawk badge can be found on the liftgate where the usual Trailhawk logo would sit. Perhaps the most prominent giveaway are the pair of Supercharged logos slapped on the lower front door panels - an easy removal with floss and Glue Gone should you want to maintain sleeper status. I admire Jeep’s aesthetic restraint here, keeping the Grand Cherokee classy without looking overly gaudy. 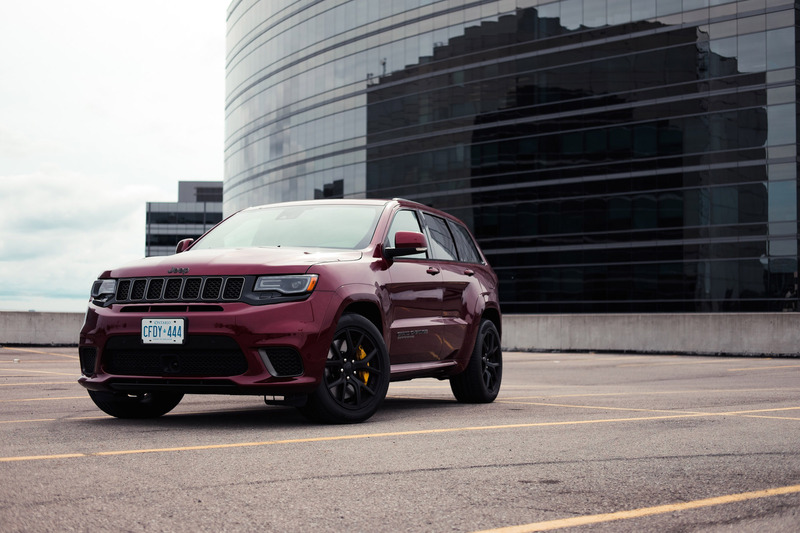 The Trackhawk is subtle and inconspicuous, allowing it to blend in with the other million SUVs in the city. Of course, that façade disappears the moment you drop the hammer. From a stop, the Jeep accelerates with rabid fervor and immediacy. It’s a relentless assault on your chest, pushing you deep into the driver’s seat, as is the soundtrack. The blower builds in pitch and volume as the tachometer climbs towards the redline. Meanwhile, the hemispherical V8 bellows through the exhaust, letting out a thunderclap every time you upshift and deafening anyone within a 50-metre radius. 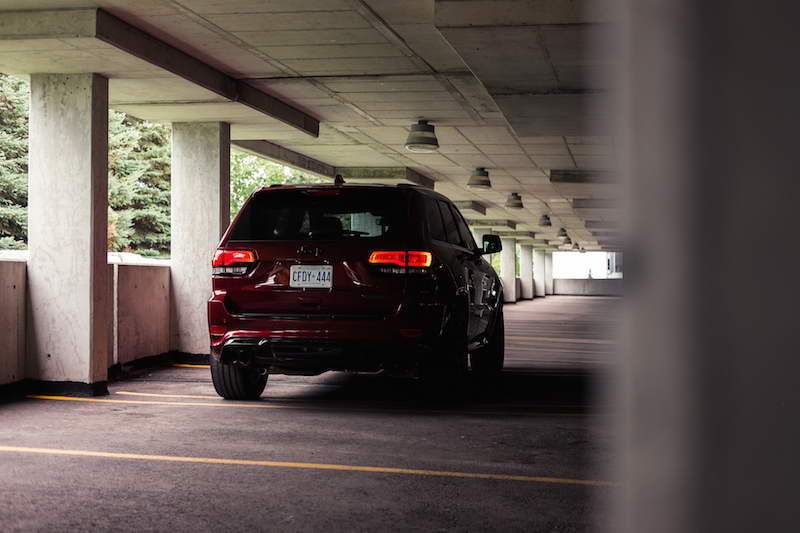 It’s an extremely visceral and addictive experience, everything an obnoxious SUV should be. Launch Control is easily accessed through the aptly titled “Launch” button on the centre console. It’s dead simple to engage: mash your left foot on the brake pedal and floor the accelerator with your other. 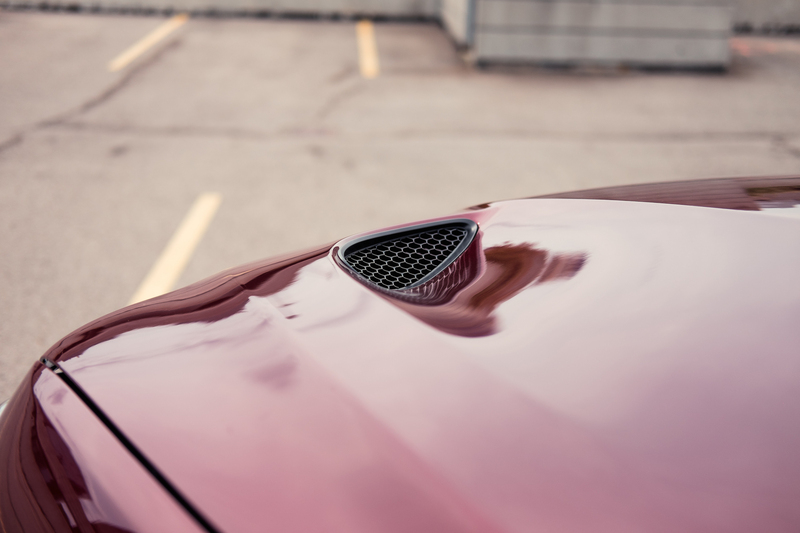 Utilizing Dodge’s Torque Reserve (first featured in the Challenger Demon), the technology cuts fuel to individual cylinders, effectively allowing the motor to rev higher, subsequently building more boost through the supercharger. Let off the brake, and truck will do its best to shear the sticky 295-section tires off its rims, all the while rocketing you from 0-100 km/h in a short 3.5 seconds. That doesn’t mean the experience is watered down. 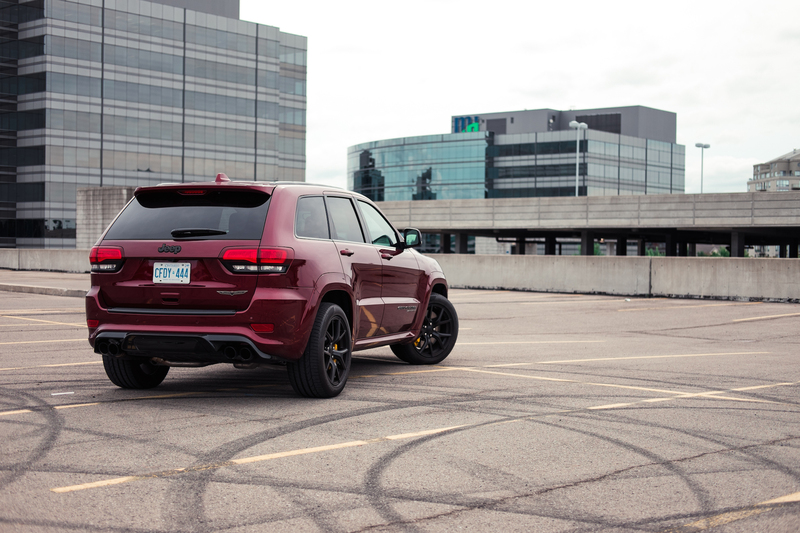 The Trackhawk is far from a one-trick pony. Bilstein adaptive suspension on all four corners firm up the ride, presumably for what the Trackhawk name implies: track work. In the firmest Track setting, the stiffer spring and damper make quick work of twists and switchbacks. Hit a corner too hot and the 2400 kg curb weight will overwhelm the truck. It’s expected in a vehicle of this stature (and height) but it’s in this aspect that the German rivals show their extra polish and outperform the Trackhawk. Likewise, in its softest settings, the ride was slightly too underdamped for the pothole ridden streets of Toronto. Offering a smidge too much movement in undulating surfaces, I ended up leaving the Jeep in the Sport setting instead for the remainder of my testing period. 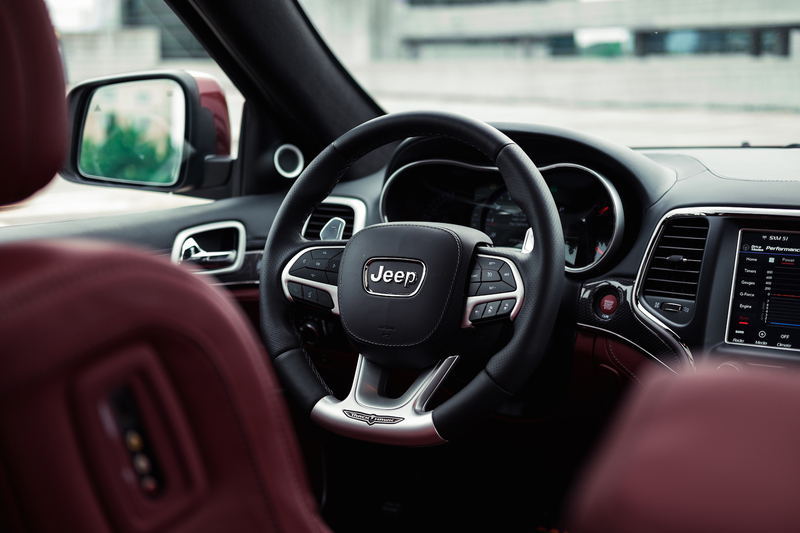 The cabin is familiar grounds for any Jeep Grand Cherokee owner, a product aimed at discerning buyers that demand exhilarating performance and luxury. 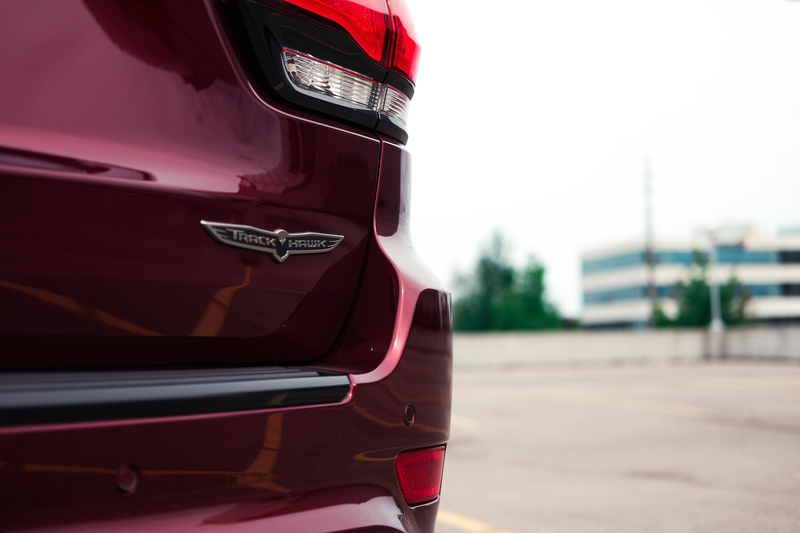 Thus, an extra layer of polish has been added compared to mid-market Cherokees. For example, seating surfaces are covered in Laguna leather and in a model-exclusive Demonic Red colourway. 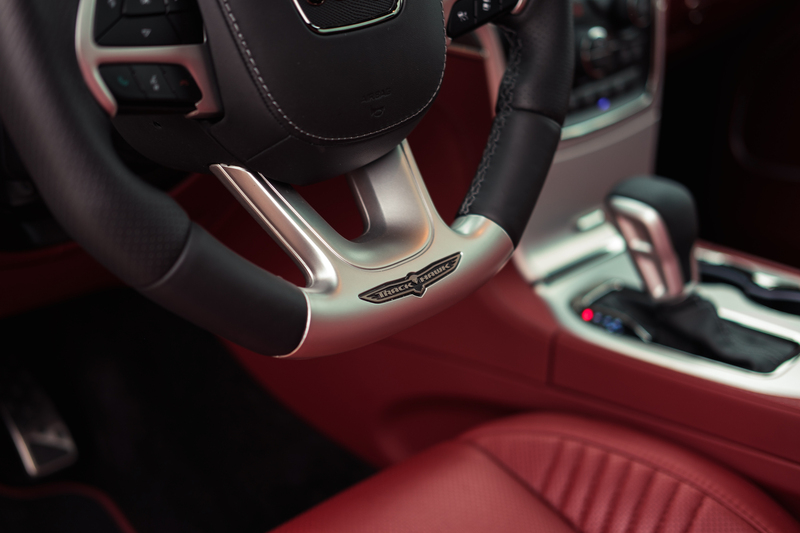 Carbon fiber accents the dashboard, simulating the appearance of a premium product. But the panel gaps and cheap plasticky steering wheel trim wholly detracts from that experience. That said, the Trackhawk is a great place to spend time in with plenty of space and storage solutions throughout. FCA’s uConnect system, while typically responsive, was quite slow in this application. 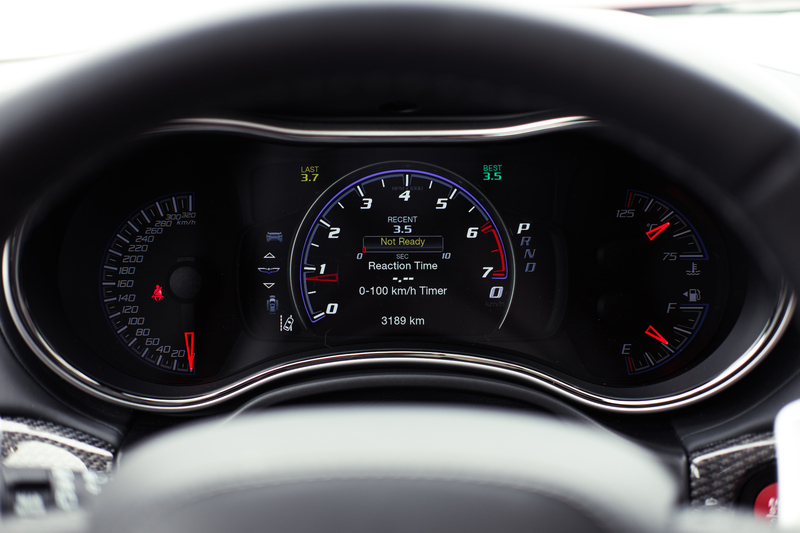 Loading Jeep’s Performance Pages is an exercise in patience, and the digital tach struggled to keep up with the speed of the motor - requiring a bit more timing finesse when shifting manually. 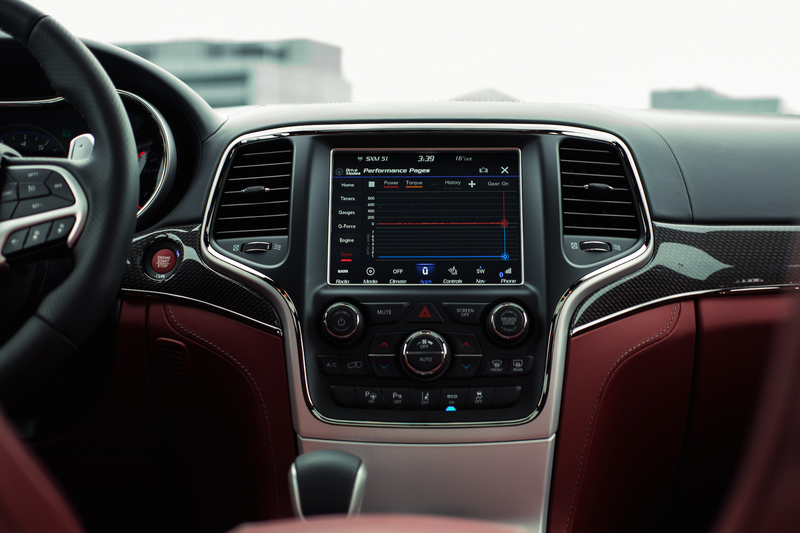 My biggest gripe with the cabin though is its lacking anything special to set it apart from the cheaper SRT model. Apart from red leather surfaces, there isn’t enough here to separate them other than a massive $35,000 price gap. Give me a unique steering wheel, metal paddle shifters, or a newly designed gear shifter - anything other than mere decals and badges. Prices start at $110,845, making this the most expensive production Jeep ever. 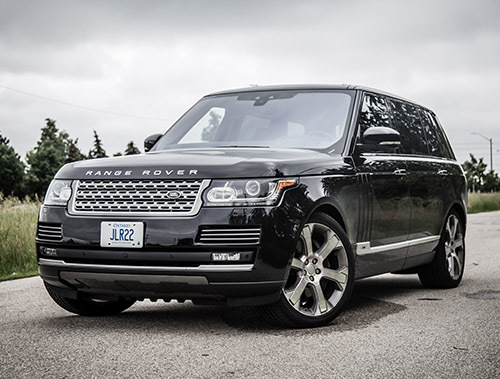 Stack on the options like rear seat displays ($2,150), dual-pane sunroof ($1,695), Harman/Kardon 19-speaker sound system ($1,995), and signature leather interior pack ($6,995), and you’ll be pushing the boundaries of $130,000. But the premium can be justified as the Trackhawk is the most practical of all Hellcat and Demon spawns, offering a liftgate, AWD, and a healthy 7,200 lb towing capacity. However, the six-figure price tag makes it hard to look at the Trackhawk in isolation of its competition. 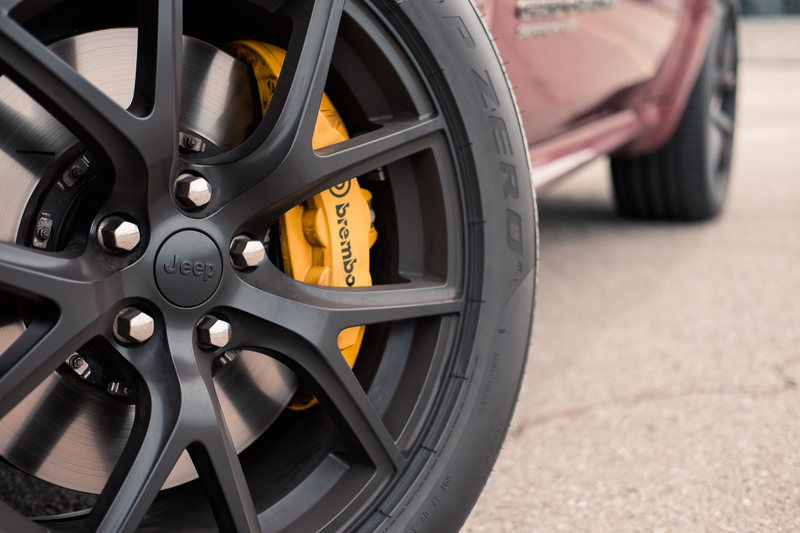 For Jeep, this is merely a boutique product catered towards a lucky few. Sure, the European entrants may lack horsepower figures that start with 7, but they offer more poise and polish in comparison. Teachers will tell you the biggest difference between an A+ student and an A- is that extra bit of brilliance, and the Trackhawk is a prime example of almost, but not quite.